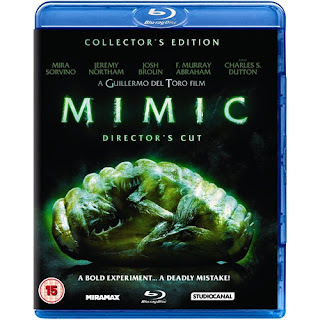 The Reclaiming Mimic featurette, commentary and video prologue are all basically different ways of presenting an interview with director Guillermo Del Toro, not that that should put you off - the opposite in fact. Del Toro speaks honestly about the original cut of the film and talks about the need to 'reclaim' the film as his own, referring, of course, to the constant meddling of The Weinsteins, which he believed damaged the film irreparably. Del Toro takes the discussion on to cover why his and The Weinsteins' brands of film-making at the time were so different, distinguishing between the need to be able to clearly 'understand' a film and clearly 'read' it as two different things. Even for someone with no interest in Mimic it is fascinating stuff. A real insight into a visionary director's working methodology. Back Into The Tunnels is a bog-standard, insultingly short, 'making of' from the film's original release and as such features a beardless Del Toro and a fresh faced Josh Brolin talking with great gusto about how wonderful they think the film is going to be. It's got no place on a disc which by its very existence rubbishes those notions. The only way of doing this properly would have been to combine the behind-the-scenes stuff with new interviews and the fact that that hasn't been done (or apparently even attempted - Del Toro is the only new interviewee on the disc) smacks of laziness. Del Toro pops up again during the A Leap In Evolution featurette to explain more creative differences. Its a short 'creature feature' with not much to add but it at least shows how the 'making of' should have been done. Mimic: The Director's Cut is released on Blu-ray in the UK on 31st October. Is the director's cut version of the film better than the theatrical? I'm doing a thing on del Toro next year and I've only seen the theatrical cut of the film. I would like to see this version but I don't have a Blu-Ray player. Del Toro obviously thinks it is so if you can organise seeing it, it might well be worth it. Plus he talks a lot about his film-making process and philosophy on the extras so you'd probably find them useful. I don't remember the original cut at all so difficult for me to judge the merits when compared to one another. Review up later this week.